Capitalists@Work: I'm Lynton Crosby. I solve problems. 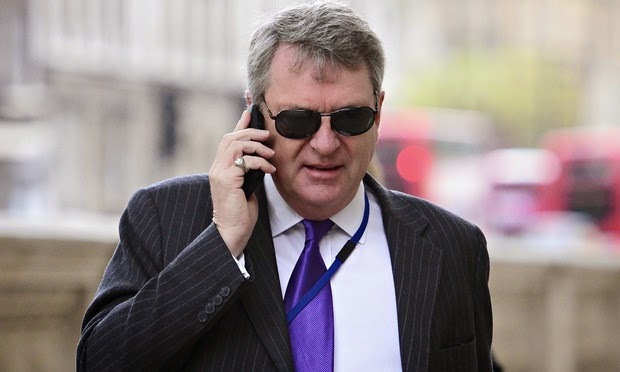 I'm Lynton Crosby. I solve problems. A sharp suited man is standing there. A small ipad in his hand. "You're Jerry, right?" he asks. "This is Tory HQ?" I'm Lynton Wolfey. I solve problems... May I come in.?" "Sure..I'm Jeremy Hunt, Health Secretary.."
"Ok Jerry. Is it in here?.." Lynton heads into a small office. He looks in and finds two men in blood stained suits..."You must be Dave ..And that makes you George..Ok genel'men.. Lets get down to business ..I believe we have a difficulty here and the clock is ticking, is that right, Jerry ?" " Now...let's see...If I rightly understand the situation." He looks at Cameron and Osborne, "Then you two ...have killed the Tory party? " Wolfey consults his ipad once more.."You took the principles of a low tax, low spend, small state economy and ... again, if my notes are correct here ... you shot them in the face?" "Accidentally. We didn't mean to do it." "Nevertheless we have the corpse of fiscal responsibility, and a dead EU referendum election strategy, in a battlebus, in a garage..or wait...does this say Farage? ..Anyway ..take me to it." They go through to Tory HQ basement strategy room with media grids, week by week focus issues and soundbite boards. There is an election battlebus there. The inside is covered in gore. "Hmmm ..This is quite a mess." says Lynton. "Ok ..Gentleman We are going to need all this soppy, gooey Lib Dem eco-mush gone by election time...or our core voters will not be best pleased, is that right?" "We have an election in 4 months. . and we need to tidy up, and get the heck out of Dodge? That should be plenty if you do what I say, when I say it." Lynton Wolfey looks into the battlebus.. Its in a very poor state. half formed ideas and bits of human rights and Big Society agenda are splattered about inside it. "George.." asks Mr Wolfey, "About the economy..anything I need to know? Is it running? Does it stall? Is it likely to overheat. Or fail to start?" "Far as I know its just fine Mr Wolfey. It was going fine and then ..well..we hit this bump. But before then the economy was fine Mr Wolfey..for...you know...an indebted European country, with an over reliance on a financial sector and a southern based service sector bias, following an almighty economic crash." Still peering into the bus Lynton calls over his shoulder, "Jerry, would you do me a favour?" I saw some coffee and an NHS privatisation report on a table back in the office..Wold you get me a cup of that coffee ? "And alter that file on privatisation." "Lots of cream and lots of sugar.."
"Erm.no.I meant how do you want me to make the file.."
"Jerry..is that the file on co-partnership..using private sector resources in the NHS and competitive tendering ? " asks Lynton Wolfey. "That's going to reduce the rising cost of the NHS on taxpayers and the government budget?" "Good..Take out any word that has privatisation or anything like that at all..Outsouscing. Commissioning. Profit..Dividends..Provider..and so on. Replace them all with some non-specific catch-all anytime phrase. But use cuddly words..like clinicians -passionate-sociological-economic-care. Or nursing-excellence-rainbow-path-gate, OK Jerry ?" "Erm..er..excuse me, Mr Wolfey. But that...that won't make much sense.."
Lynton smiles. "It doesn't matter, Jerry. No one is going to read it anyway. Just want to neutralise the bad smells. But I would like that coffee." Ok .. lets go back to the office. "Thank you Jerry," Lynton says as he takes his coffee..he has a sip. He takes in the flavour for a few seconds then he turns to Mr Hunt smiling.."This is good coffee, Jerry... Make sure there is no more of this..I want basic Nescafe or Red Mountain and Tetley teabags only..No biscuits..We have an overpaid, privileged posh bays tag to clean up too." Lynton drinks some more of the fine brew and thinks for a moment. After a second he begins to give his instructions. "OK ..here we are.. Jerry, this looks to be a very well funded party HQ..That would lead me to believe that under the sink there is a box of products that we can use to detoxify this election vehicle?" "That's good Jerry. Right..Dave and George... Dave and George..Get a box of those election leaflets," he points to a stack of crates in the corner. "These 'A Britain living within its means' ones?" asks Dave. "Yes. take those and some Windex and use them to clean all that crap up. Take as many as you like. We won't be using them. You need to be fast, fast , fast. Get into the back there and pick up all those idiot policies about green energy subsidy and selling forests. Minimum pricing for alcohol. I think I saw a great big piece of 7% GDP on foreign aid splatted on the back seat. That hug a husky..something about matching labour's spending plans..opposing grammar schools .. gay weddings in churches.. ..all those wet and soggy pieces are to go in the trash. Clean up all that interior. Clean up all that horror..Now..when it comes to the bones of the manifesto..it doesn't have to be all spik and span... just surface polished. It doesn't have to be conference clean..Just enough that a passing glance by an observant commentator or media pundit, won't uncover what's underneath. Because we are going to disguise it all with pensioner friendly voter bribes..Conceal all this old middle-ground, left-of-center nonsense with rightist sounding commitments and middle class tax cuts." George is horrified ..He blurts out.."But..Mr Wolfey..we can't begin to pay for.."
"Relax George" says the Wolfman. I said disguise with..not deliver upon. However, George..I need to raid your Treasury. Going to need lots of ...erm..like..comforters..Blankets..Snuggie-Huggie type of policies.. And some big , cover all, tablecloth type policies? " George is a little unsure what he has been asked for.."What ..you want .me to find.."
"Even more spending for the NHS. Promise them double whatever you have promised now. A ..erm..a plan to make immigrants wait five years for benefits... A search and rescue-slash- military use-slash medical helicopter branch of the civilian new army..
Maybe , a VAT reduction back to 17.5%? Make it 15%. Get something large, George. Search around for something big enough that will completely cover labour's price freeze and mansion tax and obscure Fargae's get out of EU. Gentlemen we are going to camouflage this election vehicle. Make it acceptable . It won't stand up to some nosy reporter sticking their beak in and poking around.. But to a casual voter it should seem respectable..reliable. Jerry..lead the way..You boys..get to work!" As Wolfey goes to leave Dave mutters "A please would be nice." Lynton Wolfey stops. Turns. And comes back into the office. "I said a please would be nice..You are asking me to raid the Treasury for party gain. To promise undeliverable things, while throwing away all the liberal coalition success I have had. I have kept it all together for five years. A please would be nice." Mr Wolfe is visibly annoyed. "Let's get something straight, mister. I was asked to come here to fix things. Paper over the back-bench EU split cracks. Stop the Kippers from sneaking into your back yard. Make like the debt has actually decreased and everything is Hunky-Dory in the world again. Spin the unemployment figures so that more people are in work, though productivity is back to the 1990s. ..I don't say please. I tell you what you need to do! OK ? "If you think you can win this election by telling people you kept Scotland in the Union and spending £250 billion pounds on a train track that rips through Tory shire gardens .. well lots of luck!" "Gentlemen..I'm here to help. But if my help isn't appreciated.."
"Hey ..hey .. Mr Wolfey..it ain't like that," George says quickly..trying to mollify the Wolfman. Dave is chastened .."Mr Wolfey..your help is definitely appreciated..Its just I don't like people barking orders at me..that's all.. I'm the Prime Minister of the United Kingdom." "Well if you hadn't raised taxes on your voter base, " he says, " spent more cash than a whole cabinet of Brown's. Angered teachers and infuriated the medical profession with a top down reorganisation.. whilst going back on an EU referendum pledge, allowing the whole immigration issue to become such a massive problem, 45% top rate of tax on basic earnings and a cap on child benefit..You wouldn't need my help, would you?" "If I'm curt with you, its because time is a factor. There is an election in four months and you are nine points behind where you need to be. I need to hurry you because we have only weeks to do things you should have been planning for..not wishing for .. years ago. So I talk fast. And if you guys want a way out of this mess you've made, you need to act fast..So Prime Minister..Please..With sugar on top ....clean your f##ng act up." Great story, loved it. Just one slight snag. Someone has nicked the engine and transmission. If they want it back they will have to go to the scrapyard and ask for Nigel. Heh, Heh. Very good Bill! 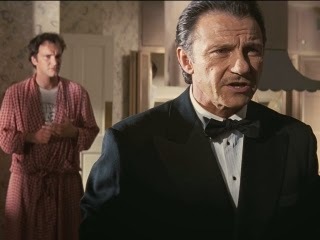 After the election, maybe you can revisit Pulp Fiction? "Whose Labour leadership is this?" "Ed's dead baby, Ed's dead.."
I think the "economy is booming" thing is getting through somehow. People are buying it and being put in a position where they think they have something to lose by voting Ukip. They don't. I note the BBC are pushing it, Legarde and Obama too. Why ? Because Cameron is a Blairist and Blairism is what the Continentals (and USA) want for Britain. A pro EU reformer betwixt capitalism and socialism (aka rich lefties) - they wouldn't mind a lefty in charge but Miliband has gone full retard on us and become a real one. Will anyone be giving Frau Merkel a foot massage ? We should have a regular post with the comedy duo. Oh dear, you have encapsulated the Tories position superbly, BQ. Labour and Greens are socialists, the Tories and LibDems are social democrats. It's got to be UKIP. A while ago I tweeted Mr crosby: "every time Cameron says 'It's the right thing to do' I think of Gordon Brown." May be coincidence but he hasn't said it since! sáu,mười bảy thước, dù nhỏ hơn chỉ bằng một phần ba so với Hắc long Dạ Tinh, phía trên đỉnh đầu còn có một chiếc sừng bạc dài hơn một thước. Xung quanh thân thể khổng lồ là một tầng tử quang, bên trong tử quang bao hàm phong nguyên tố ba động không ngừng. Hiển nhiên tốc độ của Ly Sát chính là do phong hệ tạo ra. Ngân long phi hành không hoàn toàn dựa vào thân thể mà chính là nhờ vào ma pháp phụ trợ. -Ly Sát, trên đại lục có không ít Long kỵ tướng, chẳng hạn Tây Đa Phu nguyên soái vậy, chẳng lẽ khi bọn họ kỵ long thì cũng phải thủ thế giống như ta để tránh gió hất xuống sao ?